Flat tyres can occur at the most inconvenient of times; whether you’re en-route to work, a day out at the beach or an important doctors’ appointment. It is extremely important not to limp on with a flat tyre to the nearest garage. It’s very serious safety risk and could cause an accident endangering not only you and your car but other road users too. If your car has a spare tyre you may wish to practice changing a wheel at home on your driveway in the daylight when the weather is nice and dry. That way, if you do suffer a puncture unexpectedly you are well prepared for all conditions. • Switch on your hazard warning lights. Drive your vehicle to a safe spot off the road – providing it is NOT a motorway hard shoulder – no quicker than 5mph. • If you have an emergency warning triangle in your boot then place this around 50 metres behind the car to alert other road users of your whereabouts. • Ensure all passengers are escorted out of the car and a safe distance away from the road. • Apply the handbrake and engage first gear. • Take off the wheel trim – if fitted. • Find your car’s recommended lifting point, as per the vehicle’s handbook. DO NOT jack up your vehicle in any other position as this could cause it to collapse and damage the bodywork due to a lack of balance. • Slowly unscrew the wheel nuts using a wheel brace as supplied in your vehicle. A locking wheel-nut adapter may be required if there is an anti-theft cover guarding locking wheel nuts. Be sure to store these together neatly so they can be refitted for the spare tyre. • Remove the flat tyre and fit the spare wheel. • Be sure to tighten the wheel nut at the top of the wheel first to provide initial stability. • Tighten all of the wheel nuts with your fingers first. Then use your wheel wrench or brace to tighten further (but not fully), ensuring the wheel is firmly secured to the hub. • Begin lowering the car back to its normal trajectory by turning the car jack handle anti-clockwise. • Remove the jack and tighten the wheel nuts as securely as possible using the wrench or brace in a criss-cross pattern. • Store your flat tyre in the same place your spare was previously stored and secure it with a wing bolt. • Under NO circumstances should you go underneath the car at any point of this exercise. 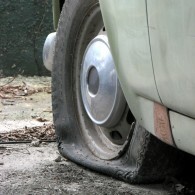 • DO NOT drive more than 50 miles on a compact, ‘space saver’ spare tyre. • NEVER use more than one compact spare tyre on a vehicle at the same time. As part of the general upkeep of your vehicle you should regularly measure the tread depth of every tyre, with a minimum legal requirement of 1.6mm across the centre three quarters of each tyre, and that they are inflated to correct tyre pressures. Follow these steps and you should be able to safely reach your nearest garage so that a professional mechanic can provide assistance and fit a new tyre for you. If you’re in the Arnold area, visit Arnold Tyres on Nottingham Road in Arnold for expert advice and assistance. If you’re in Nottingham but not close to Arnold, visit one of the Lindleys Autocentres garages located throughout Nottingham – West Bridgford, Basford & Nottingham City Centre.